I adore blueberries…fresh out of a bowl, in my cereal and especially baked into yummy desserts…throw in some lemon and I am one happy girl. Although I love some blueberry goodness, I refuse to pay the crazy high prices I have been seeing at the market. I improvised a bit and used frozen berries in this recipe and they worked just beautifully. Moral of the story, if you find a deal or don’t mind the price tag, use fresh, but frozen berries work just fine. I was actually pleasantly surprised to see blueberries on sale today at Whole Foods and picked up two pints. I have no idea what I am going to do with them yet, but I am thinking scones because scones equal bliss in my book or maybe blueberry ice cream, such a tough decision. Whatever I choose to make, I will definitely post here on MBA. 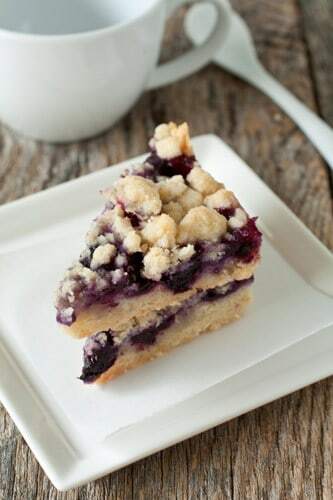 I came across these Blueberry Crumble Bars on allrecipes and knew they would be amazing. I kicked the flavor up a bit by using butter instead of shortening, adding in a bunch of lemon zest and a splash my homemade vanilla extract. 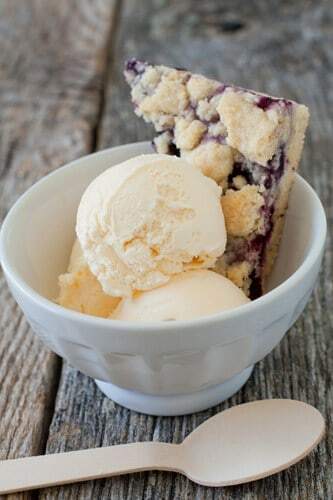 The lemon-blueberry flavor is great for summer and the texture of the topping is absolute perfection. Honestly they are delish for breakfast with a cup of coffee, as dessert witha nice scoop of vanilla ice cream or as a snack…it’s truly an anytime of the day baked good. These also travel pretty well, so if they strike your fancy, be sure to bookmark them for a future summer barbeque. If you decide to make these, definitely come back and leave a comment letting us know you liked them. Have a fantastic and delicious weekend! 1.Preheat the oven to 375 degrees F (190 degrees C). Line a 9×13 inch pan with parchment paper and spray with nonstick cooking spray. 2.In a medium bowl, stir together 1 cup sugar, 3 cups flour, salt, lemon zest and baking powder. 3. In a small bowl, whisk the egg and vanilla together until combined. 4. Use pastry cutter or your food processor (see not below for alternative method) to blend the flour mixture with the butter and egg/vanilla mixture. Dough will be crumbly. Pat half of dough into the prepared pan. 5. In another bowl, stir together 1/2 sugar and cornstarch. Gently mix in the blueberries. Sprinkle the blueberry mixture evenly over the crust. Crumble remaining dough over the berry layer. 6. Bake in preheated oven for 45 minutes, or until top is slightly brown. Cool completely before cutting into squares. Note: If you do not have a pastry cutter or a food processor, simply freeze your butter and use a box grated to grate the butter into the flour mixture. Use two forks or your fingers to fully incorporate. Just made these, they are so simple to make and taste SOOOO good. Thanks for the recipe, I will definitely make them again!! I’m so glad to hear that you enjoyed this recipe. Thanks so much for taking the time to come back and give us your review! Have a great day. Do you think I could make these a day ahead? I think they would be just fine if made the night before you serve them. Hope this helps. Have a great day. I would just add them in frozen. Thanks for stopping by. These were SO delicious! My family adored them!! Check out my blog to see my version of these delectable bars! Do you think I could freeze these to bring to a party next week? I haven’t tried freezing these, but I think they’ll be just fine. Thanks for stopping by. I will be making your cranberry crumb bars as my Thanksgiving meal contribution, but made this blueberry version tonight just for us to have here at home. I just happened to have 4 cups of blueberries in the freezer and everything else on hand too…love when that happens! These are really quite delicious. I just love your site…thanks for all of the wonderful recipes and gorgeous photos! I am so glad you enjoyed the recipe. Thank you for stopping by and providing your feedback – have a great day! I recommend using fresh lemon zest for this recipe. Have a great day. This recipe sounds great, about how many does it make? I’m thinking about halfing the recipe for a small group of us, but wanted to make sure it made enough first. It’s been years and years since I made this recipe, so I don’t remember the exact yield. I think it makes about 12 bars. I made these for a preschool event and had loads of Mum’s in rapture, even making someone’s day with them, apparently! I’ve had nothing but great comments when I’ve made them and they’ve become a firm favourite. Are you ment to thaw the frozen blueberries first. The blueberries do not have to be completely thawed, just enough to spread them evenly. Thanks for stopping by.